I often find medical non-fiction interesting and really enjoy reading true stories of medical anomalies or stories where patients overcame medical struggles. In BEDLAM’S DOOR, stories of mental illness are told through the eyes of a psychiatrist. Rubinstein shares patients he met while working in a hospital, often meeting the patient as they arrive in the ER via their own admission, through the police, or admitted by concerned family members. In these true stories, patients are dealing with a myriad of mental psychosis including depression, OCD, and PTSD to name a few. Many of them were living their every day life until something happened to change that chemical balance in their lives. Whether it was a traumatic event, unforeseen stressor, or long buried illness, these patients hit a breaking point and were unable to continue to manage their symptoms on their own. Even though Rubinstein only sees them at the beginning stages of their admission, he is able to give an update through checking in with co-workers and following the case at least until discharge in most cases. The stories are short, with each chapter featuring a new patient. He offers a bit of background and a review of their initial conversation upon admission. 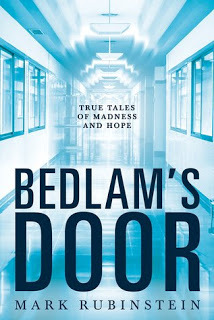 These case studies give readers an understanding of how out of control the disease of mental illness can be and how scary it can be for both the patient and for their family. I can see those who may know someone suffering from mental illness would find these stories comforting and yet fascinating. In nearly all of these cases, the inpatient and outpatient treatment helped them move forward in their lives and get past the issues that brought the mental illness to the surface. CBS News recently ran a story on Rubinstein and his new book. Click HERE to see the article. Mark Rubinstein MD was born in Brooklyn, New York. He dreamed of playing baseball for the Brooklyn Dodgers since his all-time hero was the Dodgers’ first baseman Gil Hodges. Rubinstein played high school baseball and ran track. His love of sports led him to read sports fiction, and soon he became a voracious reader, developing an enduring love for all kinds of novels. In addition to running his private practice, he developed an interest in forensic psychiatry because the drama and conflict of the cases and courtrooms tapped into his personality style. He also taught psychiatric residents, interns, psychologists, and social workers at New York Presbyterian Hospital and became a clinical assistant professor at Cornell University’s medical school. Rubinstein’s high-octane thriller Mad Dog House was a finalist for the 2012 ForeWord Book Of The Year Award for suspense/thriller novels. His 2nd thriller, Love Gone Mad, was published in September 2013 and his novella, The Foot Soldier (November 2013) won the Silver award in the 2014 Benjamin Franklin Awards competition, in the Popular Fiction category. His novel Mad Dog Justice (September 2014), tagged as a “pulse-pounding tale of post-modern paranoia,” is a finalist for the ForeWord Book of the Year Award. His novella, Return to Sandara, (October 2014), won the gold IPPY Award for Suspense/Fiction. His latest novel, The Lovers’ Tango, published in June 2015, has won the Gold Medal in Popular Fiction for this year’s Benjamin Franklin Award.